AP FILE PHOTO - Iowa’s Tyler Cook dunks during the second half of a college basketball game against the Illinois in the second round of the Big Ten Conference tournament Thursday in Chicago. 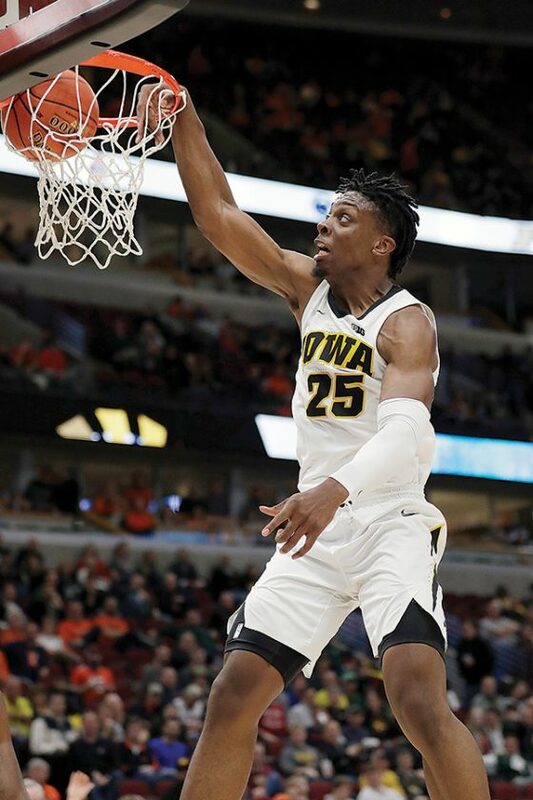 IOWA CITY — University of Iowa men’s basketball junior Tyler Cook announced on Friday his intentions to hire an agent and enter the 2019 NBA Draft. In his third season with the Hawkeyes, Cook was a second-team All-Big Ten Conference selection by the media and earned all-district accolades by the NABC and USBWA. He led the team in both scoring (14.5 points per game) and rebounding (7.6) while ranking fifth in Big Ten in free throws attempted per game (6.12), eighth in rebounding, 12th in scoring, and 13th in field goal percentage (.528). Cook is one of nine players in Iowa history to total more than 1,300 points and 600 rebounds in his career. He posted a team-best six double-doubles this past season and is one of 15 players in Hawkeye history to record at least 15 career double-doubles. The NBA Draft will be held on June 20 at the Barclays Center in Brooklyn, N.Y.